Many airlines fly direct to San Juan from which Cape Air flies to Anguilla a few times per day on code share flights with Jet Blue and Continental. 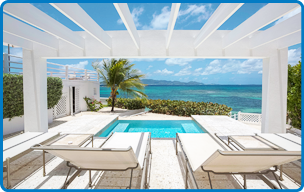 Anguilla Air Express & Cape Air offers VIP transfer service in San Juan and flies daily to/from Anguilla - your villa concierge can help arrange. Vehicle Rental Agent will provide the license when renting a vehicle. Drive on the Left and 20 mph in villages and school areas. Average speed is 30 mph. 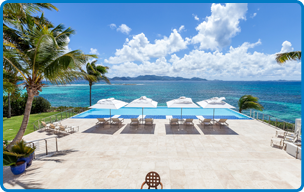 Villa Paradise & Anguilla use the same 120V and outlets as used in the United States. Travelers from the United States can use their appliances without any need for adapters and converters. Travelers from Europe and other destinations should prepare as if visiting the United States. Your villa concierge can help arrange for any adapters and converters you may require prior to your arrival. 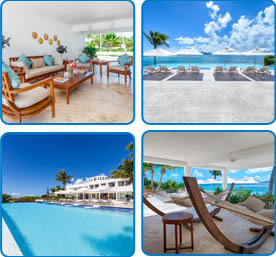 Villa Paradise is the most luxurious Caribbean villa rental in Anguilla. If you want luxury and relaxation while in Anguilla, Villa Paradise has it all! Villa Paradise is beautiful Anguilla, beachfront luxury property. See photos. Luxury and fun! 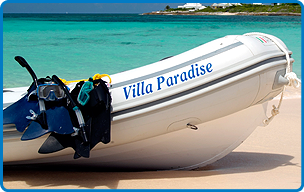 See our list of Things to Do while at Villa Paradise! Check our Reservation Calendar and start planning your stay at Villa Paradise!